The Military Commission Act of 2009 states that the commission may prosecute only those crimes “committed in the context of and associated with hostilities” § 950p(c). Given the uncertainty about when any armed conflict with Al-Qaida commenced, we’ve raised before the question of whether al-Nashiri has been charged with a crime properly prosecutable by military commission. Assuming for now the existence of sufficient hostilities at the time of the USS Cole bombing, we have also noted another open question about whether the crimes for which Abd al-Rahim Hussein Muhammad Abdah al-Nashiri has been charged—the “murder,” “attempted murder,” and injury of U.S. servicemembers; terrorism; and conspiracy, etc.—are in fact violations of the law of war. These dubious charges can be contrasted with one charge that is without doubt a well- established part of this body of law: perfidy. Indeed, the perfidy charge serves as the predicate act for the murder, injury, and property charges, transforming what might otherwise not be a violation of the law of war (the targeting of military objectives) into a chargeable offense. Even the perfidy charge, however, sits on an uncertain footing. Al Nashiri … did … invite the confidence and belief of one or more persons onboard USS Cole …, that two men dressed in civilian clothing, waving at the crewmembers onboard USS Cole, and operating a civilian boat, were entitled to protection under the law of war, and intending to betray that confidence and belief, did thereafter make use of that confidence and belief to detonate explosives hidden on said civilian boat alongside USS Cole, killing 17 Sailors of the United States Navy … and injuring one or more persons, all crewmembers…. protected status by the use of signs, emblems or uniforms of the UN or of neutral or other states not parties to the conflict. These acts constitute perfidy when they are employed in order to kill, injure, or capture the enemy. Thus, there is no inchoate liability for attempts to commit perfidy (and thus perfidy is not charged against al-Nashiri for the failed attack on The Sullivans); nor is the use of perfidy technically prohibited in retreat, to forestall an attack, or to achieve military objectives (such as delay or confusion) other than the killing, injuring, or capture of the enemy. Treachery, which does not enjoy a definitive definition, is widely believed to include assassinations, placing a price on the head of an enemy, hiring killers, etc. Although not applicable here, it is interesting to note that the rules governing perfidy contain a curious exception for naval warfare and in particular for “the use of flags in the conduct of armed conflict at sea.” This refers to the practice of using so-called false flags—generally enemy or neutral flags—before engaging in attacks. Whereas perfidy and treachery are strictly prohibited, ruses of war are not. These are acts of deception that do not invite the adversary to believe that the law of armed conflict offers protection to the actor. Ruses include: camouflage, decoys and dummy materiél, altering signage, simulated operations or attacks, ambushes, misinformation, and even psychological warfare to impact moral or induce surrender or rebellion. All that said, the grey area between perfidy and ruses remains open to argumentation. The commentary to Additional Protocol I does make clear that the prohibition on perfidy applies only in armed conflict and with respect to those participating in hostilities. Herein lies the rub. 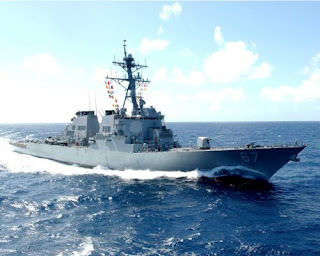 Unless the United States was engaged in an armed conflict, USS Cole’s crewmembers would not have been on notice of the need to evaluate whether the two individuals in civilian clothing on a civilian boat were civilians or combatants. Absent an armed conflict, there is no claim to legal protection, no deception of the adversary, and no breach of confidence. tragic loss reminds us that even when America is not at war, the men and women of our military still risk their lives for peace. So, it all boils down to the question of whether an armed conflict was underway in 2000. Accordingly, al-Nashiri’s civilian counsel, Richard Kammen, filed last week an action against Vice Admiral Bruce MacDonald, the Convening Authority, in the Western District of Washington seeking declaratory relief on this very question.